Oy. I owe memes! I owe so many memes, I’m not sure who I owe them to anymore. But here’s the one that Becky started, nearly a month ago, asking for pictures of the view from my front door. Can I just say? The view in March is rather pitiful. The grass is brown, there are no leaves on the trees and the garden is just a patch of earth and mud. I didn’t even manage to capture any birds at the bird feeders. This is the view as I look to the left of my front door. 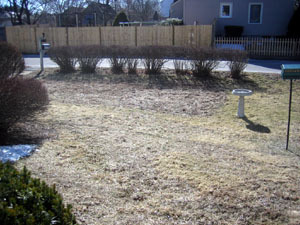 It’s where we have our garden in the summer, as evidenced by that big patch of brown. No, not the brown grass. The brown mud. While it may seem strange to some people to put the garden in the front yard, it’s where we get the most sun. It’s also right outside my kitchen door, making it an old-fashioned (and very convenient) kitchen garden. This is what I see if I look straight ahead while standing on my front stoop. Bird bath, bird feeders, but no birds. Trust me, they are usually there. We get chickadees and cardinals and lots of sparrows. There are goldfinches and tufted titmice and several different varieties of woodpeckers. There’s even an occasional hawk on the hunt. It’s quite entertaining for Mason, really. Finally, this is my view to the right. As you can see, I live on a corner lot and this is basically main street in my town. 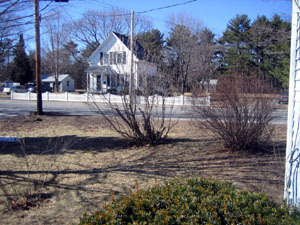 I do love my neighbor’s house, it’s such a charming example of New England. At last, a bit of color. I can’t see this first, tiny crocus from my front door, but I found it when I walked around the corner to go back in the house. Ahhh! Spring! So, that’s that. My front yard. Hope you enjoyed the scenery! The really is a nice sized yarn. I’ll be it’s really something to see when it gets green. (Maybe next month at this rate.) Nice photos! Dave, your Freudian slip is showing. Yes, we are always thinking of yarn. You have a crocus! We have none yet. And I would absolutely put the garden wherever the sun was. I actually had a neighbor say to me, “we can’t have a vegetable garden because there’s no sun in back.” Some people have weird priorities. I love your crocus picture. I found on in my yard when I went on my “field trip” and I was so surprised. I just had to post it. Holy crap, you have a crocus already??! So jealous. Loverly neighborhood you got there, and at least the sun is shining! I keep checking my garden for any sign of spring flowers, but nope. Not yet. Lucky you! 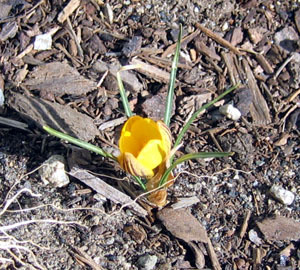 Great – a crocus! It is only 2 weeks until the official start of SPRING!!!!! YAY!!! Thanks for the flower, Carole. I love crocus — en masse is my favorite, even though I never have it together enough to do it. Mud season! 🙂 I used to always get so excited when I saw my frist crocus of the season. What a perfect little crocus! I heard we might get into the sixties this weekend, yay! Thanks for the tour of your front yard. I love the kitchen garden – so convenient! I did, indeed, enjoy the scenery. This has been one of my favorite things to course blogland! I love to get a peek at my favorite’s world! Thanks for the tour. I feel as if I know a bit more about Carole now! Ahh Carole, thank you for posting this! I know everyone says that their brown grass is boring but its not. It’s interesting to see pieces of the world that belongs to the bloggers that we frequently read. Of course I know it will be prettier when the grass is green. We’ll do this again in June or July so everyone can put their “best view” foreward… (smile). Nice view, even winter-style. Hooray for the first crocus of the season, spring cannot be far away. I love getting little glimpses into the lives of others. It’s so much fun! a crocus!! I can’t believe it. 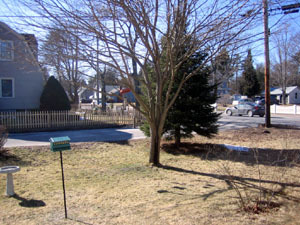 The snow is melting fast, but there is still snow. A garden in the front yard is pretty darn cool, I think, as well as practical. Looks like you have a nice, peaceful main street. I love the New England house, too. Thanks!